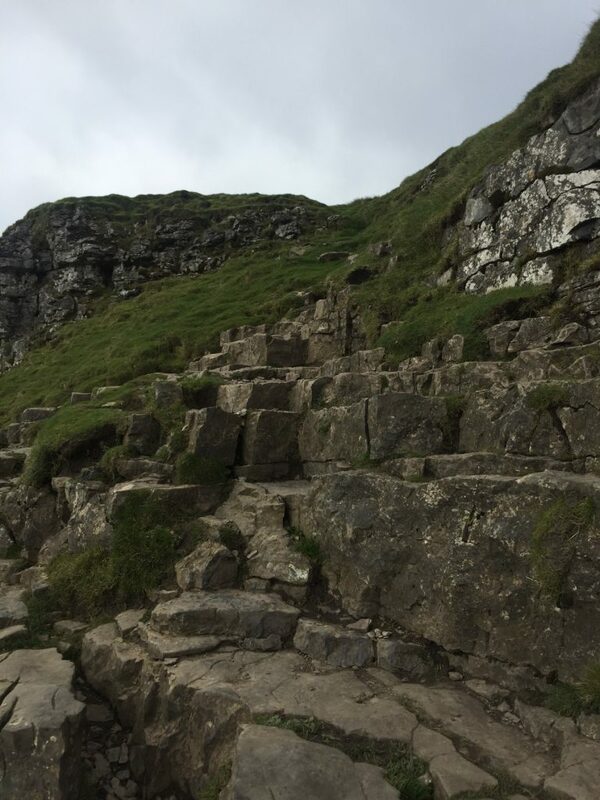 At 694 metres Pen Y Ghent may be the smallest of the famous Yorkshire Three Peaks (the other two being Ingleborough and Whernside), but with its distinctive shape and dominant presence, it’s the stand out mountain of the three. This circular walk from Horton to Pen Y Ghent and Plover Hill is unusual because the mountain itself is always in sight. Sometimes it bears down on you and challenges you; at other times it feels more like a friendly companion watching over and guarding you. It’s a constant feature during a walk that offers constant variation and change. Its presences also makes it easy to keep your bearings and stop you getting lost. There’s also another reason why the mountain always stands out…and that’s its peculiar name. peculiar name. No one is quite sure where it comes from. Pen means ‘top’ or ‘head’ in the ancient Cumbric language (which, interestingly, is very similar to modern Welsh). No one is quite sure what ‘Ghent’ means, although it could be taken to be ‘edge’ or ‘border’ or wind. So, Pen Y Ghent could mean ‘Hill on the order’ or ‘Hill of the Ghent’. We parked up at the Golden Lion pub in Horton-in-Ribblesdale and dropped our £2 into an honesty box to cover the charges. 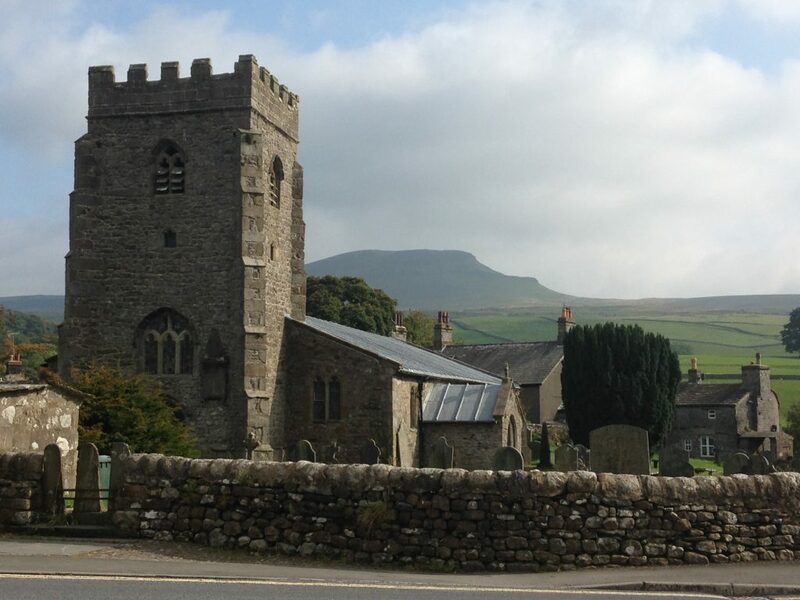 Over the road we see the picturesque St Oswald’s Church and, as if it’s perched on its shoulder, Pen y Ghent behind it. We then followed the road south for about ten minutes, ignoring the first turning to the left, but taking the second. This road is straight, pointing eastwards. Looking up you see Pen Y Ghent to your left. Directly in front of we see a paddocked hillside, whose brow is clearly defined against the clouded sky. Before you reach the crest of this hill the road forks left and then quickly right, making its way past Dub Cote Barn. The road peters out here and follows the grassed pathway that climbs more sharply and swings southwards. 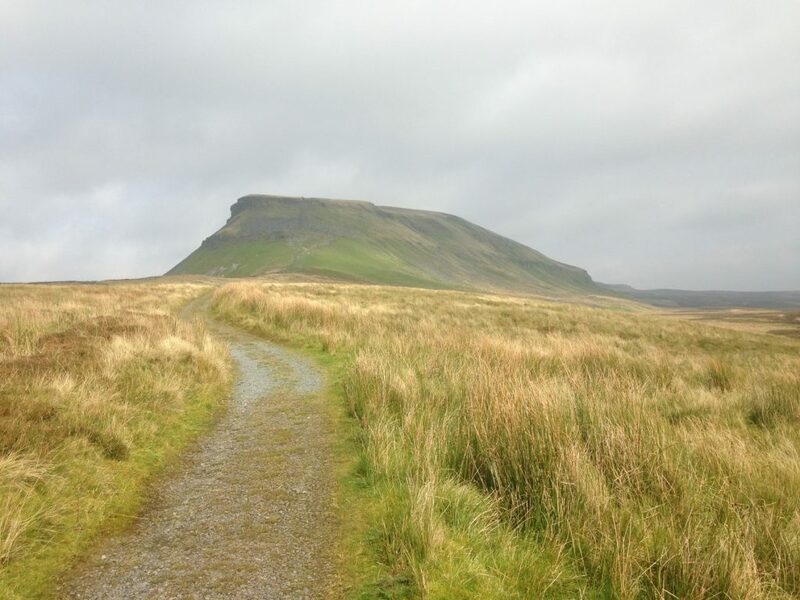 You are now heading away from Pen Y Ghent…not for long though. You soon link up with a well-defined track called Long Lane. You turn left and the mountain is now in front of you. Proud and imposing it looks directly down at you, both challenging you and drawing you closer at the same time. Soon the path meets the Pennine Way, which joins us as you head ever nearer to what looks like a sharp and brutal ascent of Pen Y Ghent. The climb is tiered in two. Gradual steps soon get tighter and deeper as we begin to rise rapidly. We feel our breath quickening and muscles tiring. Looking up we realise the challenge in front of us as the summit still seems some way off. But then the path plateaus, giving us a short respite before the final ascent. There’s now no ordered pathway and we must pick our own route up and over a matrix of stone and rocks. It’s not hard though. The random nature of the rocks allows us to rest slightly as we pick out your own route up to the top. And then suddenly we are there. The trig point is right in front of you, offering magnificent views eastwards across the valley to Fountains Fell. We now walk along the ridge of the mountain. 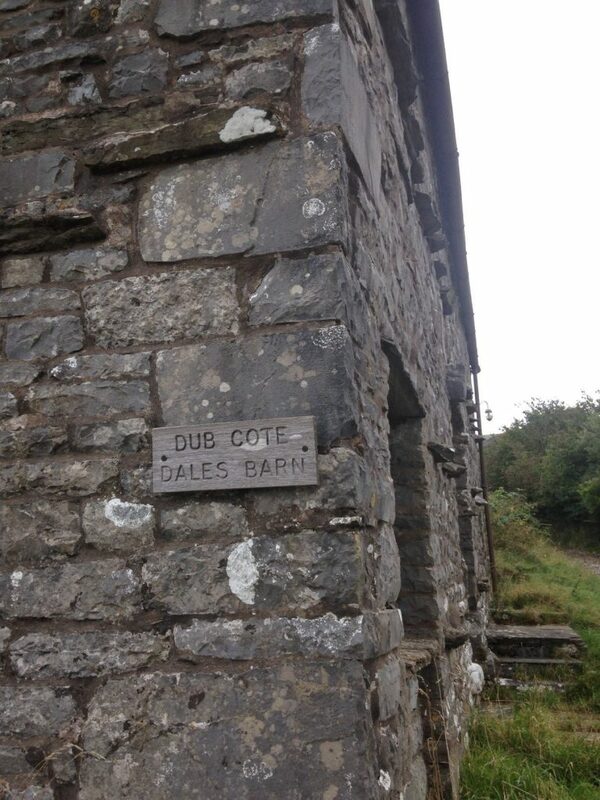 Those following the Pennine Way soon duck down and head directly back to Horton in Ribblesdale. We head straight on towards Plover Hill which lies at the other end of the mountain’s ridge. The pathway lies next to a stone wall. It’s a little boggy in places requiring us to weave around to keep our feet dry. After a mile and a half we know we’ve reached Plover Hill because the land begins to slowly fall away in front of us and we can see more of the valley below. The path downwards now steepens sharply across the wonderfully named Foxup Moor. Soon we meet a well-defined path. We turn left and begin our long walk back down through Horton Moor. Pen y Ghent remains a constant companion: looking leftwards you see the very ridge you walked along earlier. The gentle moorland slopes in front of you are disturbed by the sight of Hull Pot. This huge chasm with deep sides is only a short detour off you track. 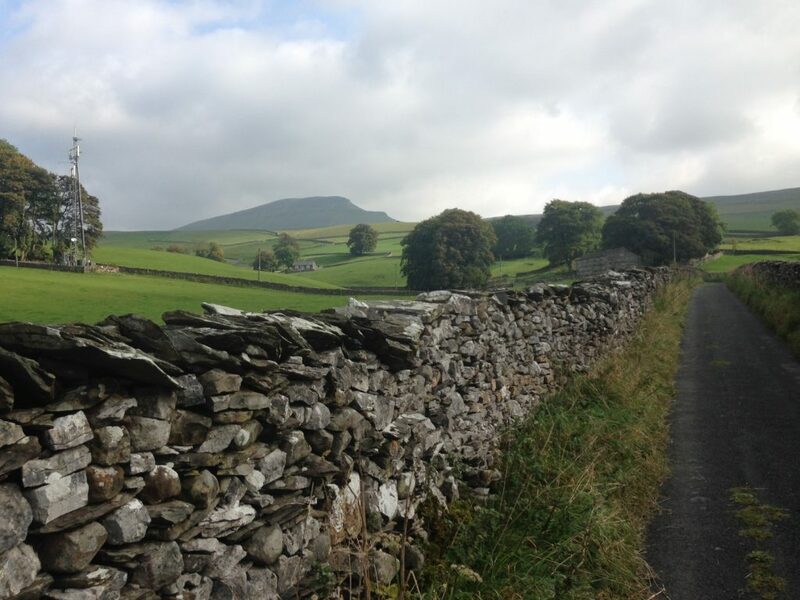 The track – known as Horton Scar Lane – soon becomes walled as you view gentle limestone moorland all around you. Finally, you dip into Horton itself and meet the road. Turning left you soon reach the Golden Lion from where you started.